The newly-installed Conference Officers making a covenant to consecrate themselves for God’s service in the General Conference Women’s Society of Christian Service. Conference delegates and ovservers posing for a photo at the meeting venue, Thistle Johor Bahru Hotel. 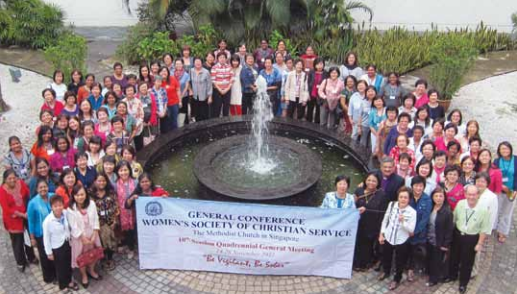 A STRONG CALL TO ACTION was delivered by Ms Dorothy Lim, the President of the General Conference Women’s Society of Christian Service (GC WSCS), in her President’s Report at the 10th Session of the Quadrennial General Meeting of the GC WSCS. The meeting was held at Thistle Johor Bahru Hotel from Nov 24 to 26, 2012, and was attended by about 100 delegates and observers. The delegates especially applauded the presence of five young women from the three Annual Conferences, whose attendance was sponsored under the Young Leadership Trainees Programme. They were: Ms Gracie Ngoi and Ms Vivien Lim from the Chinese Annual Conference (CAC), Ms Vinessa Vinodhani and Ms Ann Lavlina from Emmanuel Tamil Annual Conference (ETAC), and Ms Lindsay Chong from Trinity Annual Conference (TRAC). Ms Lim recognised the need for engagement of younger women in her report, asking: “Do our programmes attract younger women?” She acknowledged that the GC WSCS had put much effort into leadership training, especially to the younger women in their midst, but that the challenge remained in drawing young women to join the WSCS. 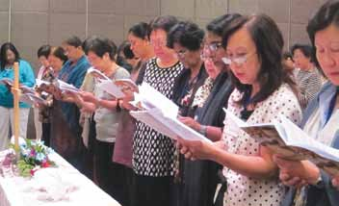 She also urged delegates to reflect on whether the WSCS programmes were impacting women on all three levels – General Conference, Annual Conference and Local Conference – and whether the programmes helped members grow spiritually to become more God-loving. Ms Lim noted that only 35 out of the 46 churches in The Methodist Church in Singapore (MCS) had a WSCS, and that the growth of membership in the GC WSCS was not keeping pace with the membership growth of the MCS. She encouraged the conference to reach out to women in their own church and evangelise to women outside the church. Finally, she expressed her prayer that the WSCS in all 35 churches would make a difference, and impact all women to live an active life for Christ, in witness and evangelism, and in their respective homes. Other responses from the delegates echoed Ms Lim’s concerns about the need for engagement with younger women in the WSCS. They noted that many WSCS members recognised this need, and suggested ways of responding to it. Mrs Eunice Yeo from Holland Village Methodist Church acknowledged that younger women tended to be busy, but emphasised the need to continue looking for ways to draw them. She commended mentoring as an excellent way, and suggested finding practical ways of engaging young women. Bishop Dr Robert Solomon, who was attending as a guest speaker and was invited to chair the meeting while Ms Lim gave her President’s Report, remarked that younger people did not tend towards organisations, but rather preferred to join movements. “They are more likely to engage if you can meet their needs in some way, maybe some programme just for them,” he said. Such programmes are possible for members of the GC WSCS, whose youthful spirits flowed over in exuberance during the Fellowship Night, where attendees dressed in bright ethnic costumes to share song and dance items, and took part in games with astonishing agility. The Team-Building Night also demonstrated their passion to work together in tackling issues such as domestic violence and whether the unwed should have children – which the younger women in their midst appreciated. Bishop Dr Solomon preached at the Opening Service on the first day, two Teaching Sessions, and the Closing Service on the last day. His closing sermon was titled “Living to the Lord”, based on Romans 14:1-12. He echoed Paul’s pastoral exhortation not to judge other Christians “on disputable matters”, so as to avoid fighting over wrong or unimportant things. He also pointed out that the phrase “to the Lord” appeared frequently in the passage, and stated four primary ideas in the way Paul uses this phrase: To emphasise our relationship with God, to express our gratitude to God, to be motivated by pleasing God, and to indicate our accountability to God. Reports during the meeting exemplified this accountability to God. The Vice-Presidents, Dr (Mrs) Teo Li Bee and Mrs Kanagi Kanakarajan, gave their respective reports detailing the work of the GC WSCS in the yearly Thanksgiving Service, leadership development seminars, ecumenical relations, preaching engagements, participation in activities in solidarity with the World Federation of Methodist and Uniting Church Women in support of the Millenium Development Goals, and finally preparation for the present meeting. They also highlighted the Quadrennial Theme for 2013 to 2016, “Be Vigilant, Be Sober”, which was drawn from 1 Peter 5:8. The election of officers, which was carefully considered by the Nominations Committee and carried out conscientiously, also reflected the delegates’ understanding of their accountability to God. 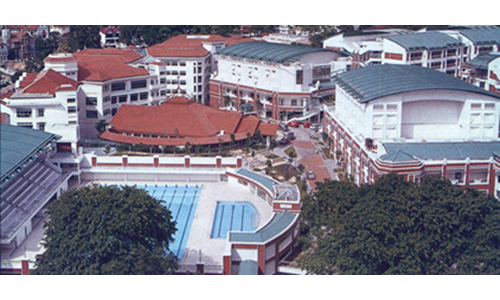 Ms Lim was re-elected as President for a second term, and Dr (Mrs) Teo was re-elected as Vice-President. Mrs Gnanamany Philip was also elected as Vice-President. Other elected officers include: Mrs Lilian Chew as the Secretary, Ms Flora Chew and Mrs Choo Lai Eng as Treasurers, Mrs Irene Tan as Chairman of the Finance Committee, and Mrs Gracie Chan as Chairman of the Governance Committee. Mrs Laureen Ong, Mrs Irene Jeevaratnam and Mrs Ivy Hue were elected as Advisors. The Presidents of each Annual Conference’s WSCS had been elected earlier in their respective conferences. They are: Ms Katherine Foo from the CAC, Mrs Kalaiarasy George from ETAC, and Ms Daisy Pang from TRAC. Ms Lim responded to her re-election as President by thanking the conference for allowing her to serve the GC WSCS for another term. She admitted that there had been a lot of paperwork in the past few years, and expressed her hope to focus more on ministry in the upcoming term.